CASA Corridor of East Tennessee is a nonprofit organization which began advocating for abused and/or neglected children in McMinn, Meigs, and Rhea Counties in 2007. The mission is to recruit and train citizen volunteers to ‘speak out’ for the best interest of abused and/or neglected children who are before the juvenile courts through no fault of their own. 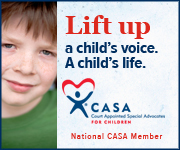 CASA advocates work to preserve the rights of each child to a safe, loving, home. The main office of CASA Corridor is located at 107 1/2 Park Street Athens, TN 37303. Our satellite office is located at 345 N. Main Street Decatur, TN 37322. Phone – 4237469037 Fax 4237469035. Email – casa_director@casacorridor.org.